For storing smaller documents, the branded Binderpod - A5 Size makes for a great option. This small, sturdy and stylish ring binder has a capacity of 25mm to ensure it can hold a lot of documents, and it also has a 2 ring D mechanism inside. Sure to be used in offices, homes and classrooms far and wide, it's a great choice if you want a useful item that will boost your branding. 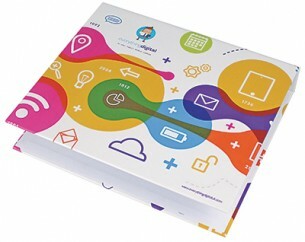 We will print your branding onto the Binderpod using digital or litho printing.